As Wisconsin goes, so goes the nation. Last December, I asked a prominent K Street Republican what he thought his party’s top priority would be following its successes in the midterm elections. He didn’t mince words. “Public employee unions are going to get hosed, and they deserve to get hosed,” he told me. So, I wasn’t exactly surprised when Republican governors in Wisconsin and Ohio put the public unions in their states on a hit list. Not merely by trying to cut their wages and benefits, which several Democratic governors are also trying to do, but by trying to snuff out their very existence. The governors themselves insist that, in depriving the unions of the right to bargain for their members, they will make it easier to balance state budgets. Never mind that the unions themselves have agreed to a pay and benefit cut, and that Wisconsin Governor Scott Walker accompanied his bid to abolish collective bargaining with state business tax cuts of about $120 million. Of course, it’s possible that the governors believe that, in the future, they will be in a better position to reduce costs if they don’t have to bargain with unions. Still, it’s more likely that they’ve been motivated by an additional consideration. For 20 years, if not longer, conservative Republicans have been lamenting the power of public unions to raise money and campaign for Democratic candidates. In the 1990s, Republicans put initiatives on state ballots to discourage unions from spending their members’ money on campaigns. And, in 2002, after George W. Bush tried to block unions from organizing workers at the Department of Homeland Security, Republicans embarked on a more ambitious attempt to deny bargaining rights to public workers. Now, Republicans like Walker seem to believe that, if they can further defang the unions, they can permanently alter the country’s political landscape. And here’s the scary part: They’re right. Republican antipathy to labor unions goes way back. During the 1920s, Republicans championed the “American plan” of corporate paternalism as an alternative to trade unionism. In 1947, after Republicans took control of Congress, a coalition of small-town Republicans and conservative Southern Democrats passed the Taft-Hartley Act over Harry Truman’s veto. Among other things, the act allowed states to pass Right-to-Work laws that forbade a union from requiring that new workers in a business it had organized become members. That allowed the new workers to become free-riders or to be recruited by employers to decertify the union. By the early 1950s, most of the South and some Rocky Mountain states had passed Right-to-Work laws, which partly accounts for the lack of unions in those states and for their conservative politics. Public employee unions didn’t really didn’t get off the ground until the 1950s. Over the next two decades, the federal, state, and local government workforce grew dramatically, from six million in 1950 to 12.5 million in 1970—18 percent of the adult workforce. The newly unionized public employees ranged from heavily minority postal and sanitation workers to college-educated teachers or nurses. The American Federation of State, County and Municipal Employees (AFSCME) and other public employee unions played an unheralded role in the civil rights and feminist battles of the 1960s—when Martin Luther King was assassinated in Memphis in 1968, he was helping AFSCME organize the city’s sanitation workers. The unions also found a receptive hearing from elected officials—moderate Republicans as well as Democrats. In the current phase of anti-union activity, which dates from the early ’90s, the key figure is Grover Norquist, the founder of Americans for Tax Reform. His ultimate aim, he told Reason in 1997, was to “crush unions as a political entity.” Norquist championed, and helped fund, initiative campaigns in California and Oregon the next year to require union members to approve the use of their dues for political expenditures. 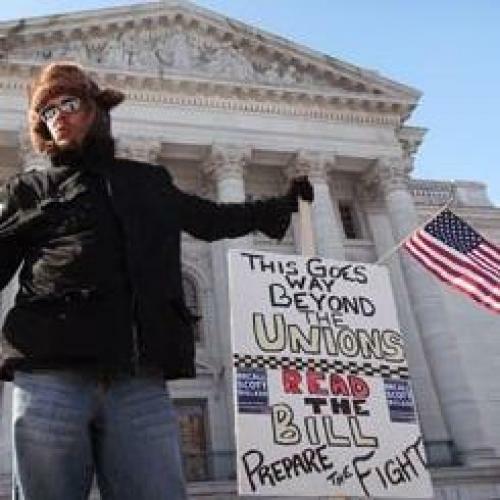 These initiatives failed, but they sparked broader agitation around public employee unions. They also led conservatives to contemplate a more drastic strategy: to wipe out public unions altogether. That remedy, however, would require Republican governors and Republican legislatures. In 2003, newly elected Kentucky Governor Ernie Fletcher eliminated union representation for state workers; in 2005, Republican governors in Missouri and in Indiana (where there was no budget crisis) eliminated collective bargaining. The Democrats’ successes in the 2006 and 2008 elections set back Republican plans to curb union power. However, as the bloom went off Barack Obama’s presidency and Republicans’ electoral prospects improved, conservatives once again set their sights on the public unions. During the last year, conservative think tanks, journals, and blogs were awash with calls to curb the public unions’ political power by eliminating their bargaining rights. Norquist and the conservatives are correct about the political benefits that Democrats have received from public employee unions. As private-sector unions have hemorrhaged members, AFSCME, the Service Employees International Union, the American Federation of Teachers, and the National Education Association have taken up much of the slack in funding and working on Democratic campaigns. Like private-sector unions, they have also promoted not simply their own interests, but a liberal agenda that generally benefits working- and middle-class Americans, as well as the poor. Raising the minimum wage, for instance, has not directly affected union members; yet the labor movement has been at the forefront of fighting to increase it. You can’t pinpoint it with polling, but public and private unions have encouraged a general political outlook that is more congenial to Democratic communitarianism than Republican individualism. If you look at a map of the 25 states where a majority of public employees are unionized, 19 of them are dependably Democratic. Conversely, all the states that lack collective bargaining for public employees are even more dependably Republican. Now, if Walker and Ohio’s John Kasich do manage to eliminate collective bargaining in their states, that doesn’t mean they will automatically vote Republican in future elections. There are other factors, such as abortion rights or clean air, that lead voters to choose one candidate over another. But, as Nate Silver recently demonstrated, the reduction of the unionized labor force—along with a drop in union funding and volunteers—can shave enough support from a candidate to tilt a close race from one party to the other. There is more at stake here, however, than which party wins elections. At the height of the New Deal, in Franklin Roosevelt’s first term, the United States was on a political trajectory that would have resembled that of post-World War II Western Europe: a full-blown social democracy with national health insurance, generous unemployment benefits, first-rate public transportation, and equal access to higher education. In the Northeast and far West, the United States has moved in this direction, but not in much of the South and border states, where wages, benefits, and the standard of living tend to be considerably lower. There are many reasons why the South has remained an outlier—not least, the legacy of racial division. But one important reason is the widespread absence of an organized labor movement. This has hindered the development of a multiracial, working-class movement that could have championed liberal Democratic politics. Instead, the Bourbon Democrats, who opposed the New Deal, were eventually replaced by like-minded Bourbon Republicans, like Mississippi’s Haley Barbour, who wasn’t satisfied with the absence of collective bargaining for public employees: He wants to eliminate their civil service protections, too. If Wisconsin and Ohio and similar states in the North eradicate public employee unions, it will certainly make it harder for Democrats to carry these crucial swing states. But it will also thwart the development of social liberalism in these states and, therefore, in the rest of the country. Voters will increasingly lack the spirit of social solidarity and responsibility that union membership has encouraged over the years. The politics of the Midwest could increasingly resemble those of the South—where God, guns, and race often trump economic considerations among the white working class—and where, as a result, the narrow interests of business prevail. Democrats could still win elections in such places, but only by abandoning the last vestiges of New Deal liberalism. It won’t just be the public employees unions that will get hosed. It will be the rest of us, too. John B. Judis is a senior editor at The New Republic. This article originally ran in the March 24, 2011, issue of the magazine.